Moving is difficult no matter your schedule. Packing can be a chore and lifting heavy furniture is not always possible for most people. Southern Cal Moving & Storage is a full service moving company. That means we can do everything, including providing packing supplies. No matter where you need to get to, we can help you do it. Call us for premium Irvine moving services. We are the movers Irvine can count on. Life doesn’t stop during a move. With work, family, and the normal day-to-day activities, it’s practically impossible to pack all your belongings in time. Our Irvine movers understand! That is why we offer services to take some of that burden off of you. Our highly trained and friendly staff is well versed in proper packing techniques to ensure your possessions arrive in flawless condition. We also have a large variety of packing supplies available—no stress required. Our number one priority is customer satisfaction. 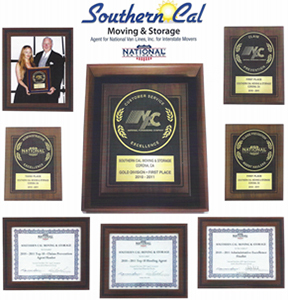 Call Southern Cal Moving & Storage today to see why we are the movers Irvine residents recommend to friends and family. Irvine is a beautiful city located in Orange County, CA. Irvine has been rated consistently as one of the safest cities in America, and one of the top cities to live in for the last five years. You aren’t far from the beaches, Los Angeles, Disneyland, Lego Land, Knotts Berry Farm, or even San Diego. With lovely neighborhoods, delicious restaurants, and lots of family activities, there is always something to do. You really can have it all when you are living in Irvine. If you need the most reliable movers Irvine has to offer, contact Southern Cal Moving & Storage or call us at 951-520-8800.